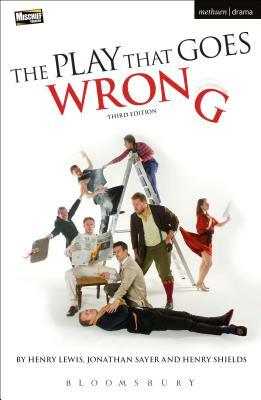 The Play That Goes Wrong: 3rd Edition (Modern Plays) (Paperback) | The Drama Book Shop, Inc.
Good evening. I'm Inspector Carter. Take my case. This must be Charles Haversham I'm sorry, this must've given you all a damn shock. After benefitting from a large and sudden inheritance, the inept and accident-prone Cornley Polytechnic Drama Society embark on producing an ambitious 1920s murder mystery. They are delighted that neither casting issues nor technical hitches currently stand in their way. However, hilarious disaster ensues and the cast start to crack under the pressure, but can they get the production back on track before the final curtain falls? The Play That Goes Wrong is a farcical murder mystery, a play within a play, conceived and performed by award-winning company Theatre Mischief. It was first published as a one-act play and is published in this new edition as a two-act play. Henry Lewis, Jonathan Sayer and Henry Shields are members of Theatre Mischief, a company dedicated to creating engaging and exciting short-form and long-form improvised theatre of an excellent standard through well-honed improvisational technique and strong theatrical ensemble work, formed of students and graduates of the London Academy of Music and Dramatic Art (LAMDA). Founded in 2008, the award-winning company has performed around the UK, creating new long-form and short-form show formats to thousands of people.